59/65 Kim Hollis Horror. Still icky. 98/159 David Mumpower I love some of the tie-ins with the last TCM, but it's still more saturated horror slayage. When last we left good ol' Leatherface and his freaky family, they were the subject of a Michael Bay-produced remake that left a number of fans of the original film cold. Even with Jessica Biel screaming her pretty little head off, lots of folks were bothered by the overly stylish treatment the update received. Even with that said, the movie made a fantastic $80 million on a slight $9 million budget. It was only natural that Bay and his Platinum Dunes production company would want to go back to the subject matter that was so profitable for them on a first try. As such, the "second" film in the series will focus on how Leatherface and friends got started in the first place. Naturally, we know that the story will be set in the past. The lovely Jordana Brewster will be doing the screaming this time around. Director Marcus Nispel won't be returning, but that's okay, because New Line has Jonathan Liebesman, who was able to turn a profit with the silly Darkness Falls, instead. 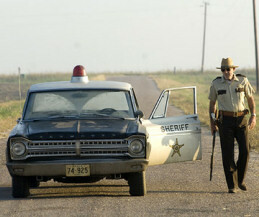 See the latest developments for this project on the Texas Chainsaw Massacre: The Beginning Movie News page.